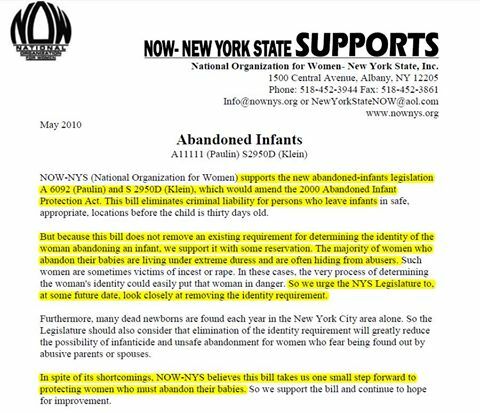 The largest feminist organization, The National Organization for Women, pressured the Government to remove criminal penalties for mothers who abandon their children and didn't stop there. When the politicians buckled under their pressure and removed the penalties they then pressured the Government to not even attempt to discover the identity of the mothers who abandoned their children so that the mothers could do so with more ease. Notice how in this memo where they admit all of this, they start off pretending as though they were speaking for parents of both genders to be able to abandon their children but then make it abundantly clear that they are only interested in pressuring the Government to allow MOTHERS to do so. This further illustrated the deep level of evil we are dealing with in opposing the feminist movement and why the damage they have caused throughout society cannot be underestimated.